What is it that makes the human brain so special? Sure it's big — but it's far from the biggest brain around. You've heard that your brain contains 100 billion neurons — but where does that number really come from, and how does it stack up against other species? You may think you know the answers to these questions, but there's a good chance you've been misinformed about what makes our brain more special than any other brains on Earth. Here are four of neuroscience's biggest brain myths, and why they're all wet. Myth #1: There are 100 billion neurons in the human brain. Neurons are the fundamental building blocks of any nervous system. These cells, the tree-like branches of which reach out and become entwined with those of their neighbors, form the vast electrical and chemical network that is our brain, processing information about our surroundings, orchestrating our actions in response to those surroundings, and even controlling our subconscious bodily functions. It's our neurons that allow our brains to do all of these things more rapidly and efficiently than any machine ever made; as we recently reported, even a toddler is smarter than the smartest AI. Given the indispensable role that these cells play, one would expect scientists to have some idea of just how many neurons we've got jumbled up together in the space between our ears; and for many years, we thought we did. Flip through the pages of a few neuroscience textbooks, scientific research articles, or science magazines and you'll find that many of them put the number of neurons in the human brain at a nice, round 100-billion — and they typically do so without citing a reference. Why no references? According to neuroscientist Herculano-Houzel, it's because there was no direct estimate of total neuron quantity in the human brain until 2009, when she and her team rounded up the brains of four recently deceased men, brought them to a laboratory, and liquefied them, using a novel technique called "isotropic fractionation." Herculano-Houzel and her team dissolved each brain into a homogenous mixture of "brain soup" (her words, not ours), took samples from the soups, measured the number of neurons in each sample, and then scaled up to find the neuronal content of each brain bisqué. Not one [of the brains] that we looked at so far has the 100 billion. Even though it may sound like a small difference, the 14 billion neurons amount to pretty much the number of neurons that a baboon brain has, or almost half the number of neurons in the gorilla brain. So that's a pretty large difference, actually. If you were to round up a handful of closely related species, crack open their heads and scoop out their brains, you would probably start to notice correlations between the animals' absolute brain sizes and cognitive abilities. Among mammals, for example, primates (like us) and cetaceans (like dolphins) have bigger brains than insectivores (like anteaters), and possess what most would agree is a proportionally greater range in cognitive abilities. Based on this observation alone, you might feel inclined to argue that brain size is a good predictor of cognitive ability. This bigger = better relationship collapses, however, as soon as you start comparing species across orders (order being the taxonomic rank above family, genus and species in the hierarchy of biological classification). Cows, for example, have larger brains than just about any species of monkey, but unless they're very, very good at hiding it, cows are almost certainly less cognitively capable than most, if not all, "lesser-brained" primates. Similarly, the brain of a capybara — the largest rodent in the world — may weight over 70 grams, but their cognitive skills pale in comparison to those of a capuchin monkey, whose brain weighs just 50 grams. Of course, for the purposes of our discussion on the human brain, the most compelling evidence that bigger does not equal better is exemplified by the difference in size between our brains and the brains of larger mammalian species, like whales and elephants. Shown here is a depiction of a human brain beside a noticeably bigger elephant brain. The average human brain weighs in at around 3 pounds, and an elephant brain can weigh close to four times that much, but the biggest brains of all come sperm whales, and weigh an average of 17 pounds. With brains that can weigh six times as much as a human's, how is it that sperm whales are not our cognitive superiors? This myth dates back at least as far as Aristotle, who in 335 BC wrote: "Of all the animals, man has the brain largest in proportion to his size." It's an easy trap to fall into, especially when you're trying to explain the differences between brain size and intelligence in, for example, humans and whales. Today, many people use the same reasoning as Aristotle to assert that the relationship between brain size and intelligence isn't about the weight of a species' brain, but rather the ratio of its brain weight to its body weight. Explore this line of reasoning in great enough detail, however, and you'll find that it provides yet another incomplete picture for what we see in nature. Sure, a person's brain-to-body ratio is huge compared to that of an elephant (about 1/40 versus 1/560, respectively); but it's pretty much equal to what you find in a mouse (also 1/40), and it's actually smaller than the ratio you encounter in some small birds (1/12). To circumvent the limitations of a basic, brain-to-body mass ratio, researchers devised a more complex measurement, known as the "encephalization quotient" (or "EQ"), that measures the ratio of an animal's brain and body size relative to other, similarly sized animals. In doing so, EQ not only takes into account that brain size tends to increase with body size, but that brain size does not necessarily increase at the same rate as body size. When scientists compare animals' encephalization quotients, they find that humans rank higher than any species on the planet. This table, via a recently published review on external measures of cognition, features the encephalization quotient of humans compared to a number of other animals (click to enlarge). For more information on EQ, check out the section titled "Encephalization Quotient" in the research paper from which this table is taken. But even the encephalization quotient is inherently flawed, for one very important reason: a bigger brain does not necessarily contain more neurons than a smaller brain — a fact that will bring us back to myth number one, and the question of how many neurons a human brain actually contains. Scientists have obviously known for quite some time that the brains of mammals can vary dramatically in size from species to species. Until very recently, however, most studies have assumed that neuronal density — i.e. the number of neurons relative to the mass of an animals brain — was more or less constant across various mammalian orders. This assumption, however, could not be further from the truth. 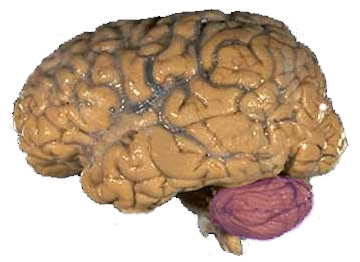 Primate brains (pictured here facing toward the left), were found to increase at the same rate that they gained neurons; if you compared a gram of brain matter from a large primate against a gram of brain matter from a smaller one, you could expect to find the same number of neurons. Rodent brains, on the other hand (facing toward the right), were shown to increase in size faster than they gained neurons. As a result, larger rodents tended to have fewer neurons per gram of brain matter than smaller rodents. 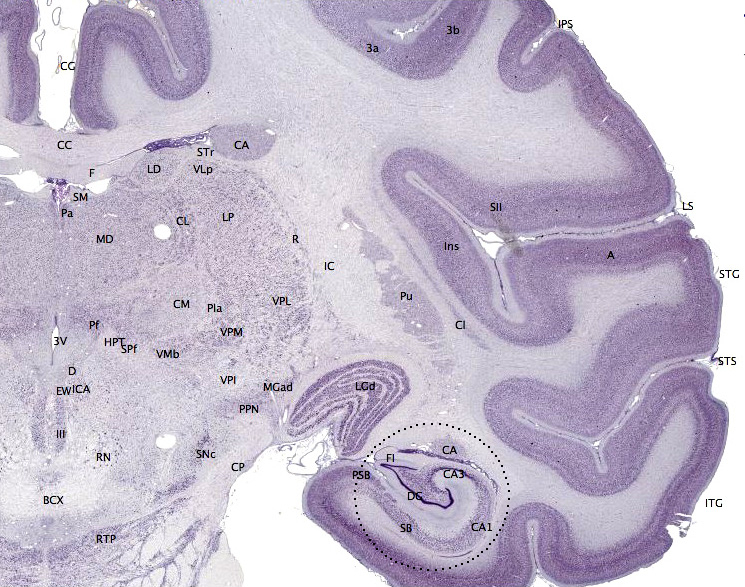 Insectivores brains (identifiable here by their bluish hue), behaved like a combination of rodent and primate, with the cerebral cortex (click here to see a human cerebral cortex labeled in dark violet) and the cerebellum (click here to see ahuman cerebellum labeled in purple) increased in size faster than they gained neurons (like a rodent), and linearly (like a primate), respectively. A 10-fold increase in the number of neurons in a rodent brain results in a 35-fold larger brain; in contrast, a similar 10-fold increase in the number of neurons in a primate brain results in an increase in brain size of only 11-fold. ...A hypothetical rodent brain with 86 billion neurons, like the human brain, would be predicted to weigh an overwhelming 35 kg — a value that is way beyond the largest known brain mass [of any creature alive today]. Is the human brain an exceptional brain? There are a lot of things to take away from our debunking of myth number four. For one thing, it demonstrates that relative brain size — even when factored into an an encephalization quotient — cannot be used as a reliable measure of neuron quantity across orders. By extension, it really drives home the point that brain size, body size, and the relationship between the two, are insufficient benchmarks for assessing cognitive abilities, and that such assessments could instead focus more attention on the total number of neurons that a species possesses. However, it also reveals two seemingly counterintuitive facts about the human brain. The first is that our brains are, to some extent, pretty unexceptional. They may contain 86-billion neurons, but that is precisely the number that you would expect to find (based on the scaling rules of primates) for a brain of its size; if you increased a chimpanzee's brain to the size of a human's, you'd find it to have just as many neurons as your own. 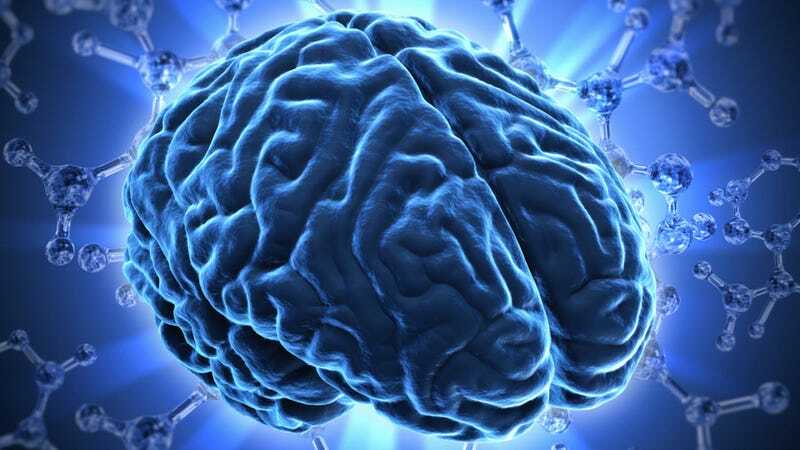 First, the human brain scales as a primate brain: this economical property of scaling alone, compared to rodents, assures that the human brain has many more neurons than would fit into a rodent brain of similar size, and possibly into any other similar-sized brain. And second, our standing among primates as the proud owners of the largest living brain assures that, at least among primates, we enjoy the largest number of neurons from which to derive cognition and behavior as a whole. How our unprecedented neuron-count combines with things like genetics and overall brain structure to give rise to the world's most advanced cognitive abilities remains to be seen. For example — if a chimpanzee's brain could be scaled to the size of a human's, would we see its cognitive abilities leap to a level similar to our own? Another as-of-yet unanswered question is how our neuron-count and scaling rules compare to those of other mammalian species — most notably those with bigger brains. To date, no studies have come up with a direct estimate of total neuron quantity in either an elephant or a cetacean brain.